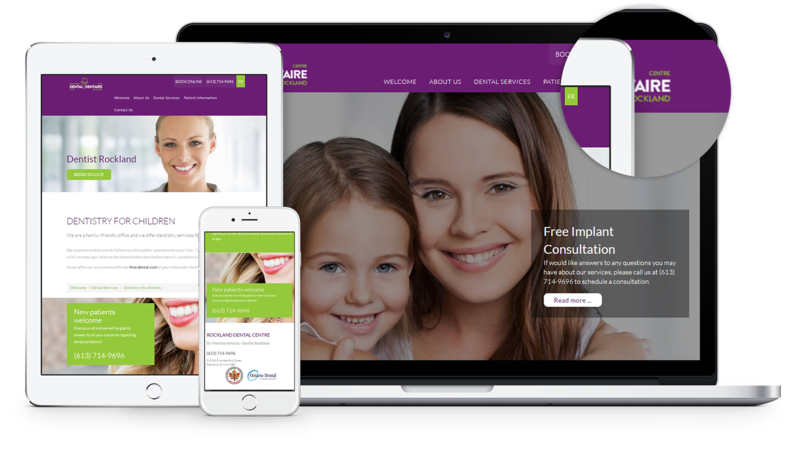 We are happy to announce the launch of a new website for Rockland Dental Centre! At Rockland Dental Centre the focus is to aim for every patient to receive the best possible care in a relaxed atmosphere. The team strives to ensure patients are comfortable and confident with the complete oral health care. They offer implant placement and implant supported dentures, everything you need for healthy teeth and gums; they offer dental services for families and individuals of all ages. The website is built on a user-friendly platform with a very eye-catching layout. The colours used are very attractive for any demographic and they invite patients to explore more of the website. There is an english and french version of the website as well. You can access the website through your tablet, smartphone and your PC. The patients can fill out an online form in order to book their appointments online and also have links that takes them to the Facebook page.